When a market filled with small boats gets mixed with smartphones and tablets, you get the Deeper Smart Fish Finder as a result. This portable sonar fish finder comes packed with some amazing technology. It's just one among many cast able devices in production, but worthy of taking a closer look. Thanks to the app included with this unit, there are many valuable functions besides the sonar itself. This device does have limitations but can be a useful tool for people who don't need a professional fish finder and high-powered sonar. With this product, you can cast off from the shore, your boat, and even enjoy some ice fishing. Deeper now offer the chance to get some of the functions of expensive units at a fraction of the price. When you add in the mounting bracket, this device can become a great addition to any small boat or kayak. With the potential for use as a flasher during ice fishing, it's clear this unit is quite versatile. All you have to do to use this fish finder is to tie it to an additional fishing rod and cast it off. When it enters the water, it will turn itself on. After that, it connects to your phone once you install the Deeper app. With everything up to date, it will start to send information to your smartphone or tablet screen. If you happen to find a spot with fish, you just have to cast off next to your fish finder and hope that they bite. We have to admit we are impressed with the looks of this fish finder. It might be the coolest looking one we've reviewed so far. It is a black sphere the size of a tennis ball and made out of ABS plastic. It fits in your hand perfectly, and it disappears into your pocket. This Deeper is the most portable fish finder we have ever seen. With this device, you can have something bigger units cannot provide. You can scan the waters in hard to reach places. Where boats can't go, the Deeper fish finder is a perfect fit. With this unit, you can see what hides under a bridge or near submerged logs. All you have to do is throw in and start exploring. 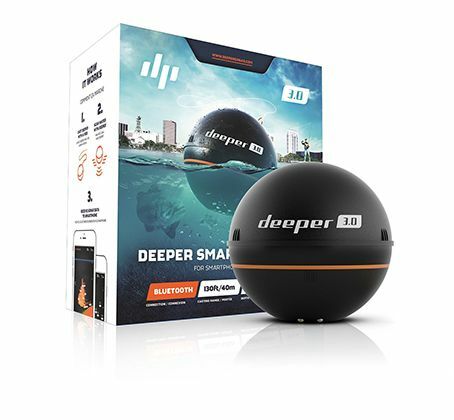 The Deeper is a portable fish finder that is compatible with both smartphones and tablets. If you're running at least an Android 4.0 or iOS 8.0 device, you can use it. This unit doesn't come with a separate display. For that, you use your mobile phone or tablet. That way you can have quite a large and high-quality screen. If you were to buy a fish finder with the display size of a larger smartphone, you be shelling out a lot of money. 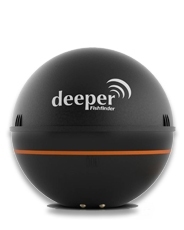 When everything ready, this fish finders sends readings to your device through a wireless connection. Since this product works with an independent wireless connection, you can use it even if you don't have cell service. All that's important is that both the unit and your smartphone have their batteries charged. During our tests, we noticed some connectivity issues when casting off near the end of this fish finder's range. Aside from that, it has some trouble relaying information when boats pass, or when the water gets rough. The Smart fish finder works with dual beam sonar frequencies. One at 290 kHz with a 15° beam and the other at 90 kHz using a 55° beam. The narrow beam gives more details from sonar readings, while the wider beam scans a bigger area. When combined they offer the best of both worlds and let you take a look at what lies beneath the water's surface. This unit can give readings up to 130 feet deep with an approximate width of 16 feet. The range isn't great in comparison to other devices, but it isn't a big issue. After all, you can always reel it in and re-cast to get new readings if you're not catching anything. The readings we got in our test weren't always accurate. It seems like the Deeper fish finder sometimes has trouble determining what is vegetation on the bottom and what are fish. In comparison, depth readings were precise when compared to a professional fish finder. You can not only connect the Deeper to your phone but use some great apps with it as well. With a customized fishing log you can keep a record of relevant information. You can also use the integrated camera function. If you want, you can check the weather with current reports. This feature also lets you see the rise and set times of the moon and sun. Besides that, there's an option share what you see and catch on social media networks. With depth alarms, you can get sound notifications when you reach a certain depth and fish alarms alert users to fish that meet certain size criteria.